It's here! The book you've been waiting for! 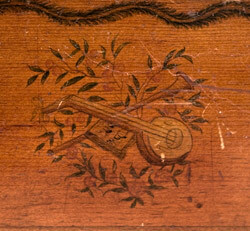 For the first time, the lost art of Women's Painted Furniture, 1790-1830, is rediscovered. This style of early American Decorative Art is largely unknown to museum curators, antique dealers, art historians and the general public. The book defines the art form as part of American Schoolgirl Art and clarifies what is and is not Women's Painted Furniture. The historically authentic process of creating Women's Painted Furniture is documented; including the results from chemical analysis of antique pieces. The complete process from selection of cabinet makers and woods, varnishes and paints, and the specific techniques and tools used 200 years ago are detailed. Betsy’s book represents forty years of research, and includes over 238 pages, 200 colored, and 46 black and white images. Hard bound cloth cover. The style, designs and patterns in Women's Painted Furniture come back to life in a compendium of motifs. The close relationship and overlap with other American Decorative Arts, particularly needlework, is explored along with the symbolic uses of these similar motifs. 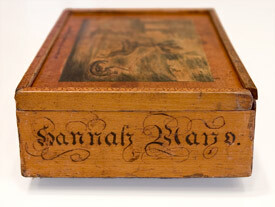 Instruction in the Female Accomplishments included 'painting on wood' in many New England academies. This art advanced education for women in our young nation. The book chronicles the specific schools, academies, seminaries, teachers, instructional materials and students of Women's Painted Furniture. One chapter is dedicated to individual American Schoolgirl Artisans, their genealogies and provenances of their antique pieces. Betsy brings back to life these unrecognized women and validates the historic contributions of their art work as practical artists who ornamented domestic items for their homes, families, loved ones and friends. She brings her unique perspective as scholar, artisan and teacher to this lost art.